Returning to a system of taxation without representation where a European power taxes Americans is unacceptable. The European Union (EU) has ruled that Apple, one of the world’s top technology companies, must pay $14.5 billion in taxes to Ireland, despite the fact that Ireland has determined that Apple has paid all the taxes it owes. The nation of Ireland has reviewed Apple’s tax filings and has determined that Apple has paid 100% of the taxes it owes under Ireland’s tax code. But the EU has stepped-in and said that Ireland doesn’t understand its own tax laws, that Ireland’s review of Apple’s taxes is incorrect, and that only EU bureaucrats in Brussels can understand Irish tax law and Apple’s tax filings. Tim Cook, Apple’s CEO, described this EU ruling as “total political crap.” Tim Cook is quite frankly being very kind in his characterization. The truth is — this is far worse than that. Aside from the hubris of a bunch of pointy headed bureaucrats in Brussels telling Irish tax authorities that they don’t understand their own tax code, this is actually an attempt to legalize grand theft robbery. At the very least, the EU is now officially in the shakedown racket. No wonder Brexit was a success! What sane individual would want to belong to this group of lawless gangsters pretending to be an overarching cooperative governmental entity? Some Americans might privately say that while this is unfortunate for Apple, it isn’t my problem. But the truth is — this is our problem because the EU is effectively reaching into your pocket to grab this taxes. You might think that Apple will pay this taxes, not you. But this overlooks the fact that if Apple is forced to pay extra taxes by the EU, it can legally and properly record that paid taxes elsewhere on its US tax returns — because no business is required to pay taxes on its profits multiple times. Once is enough. 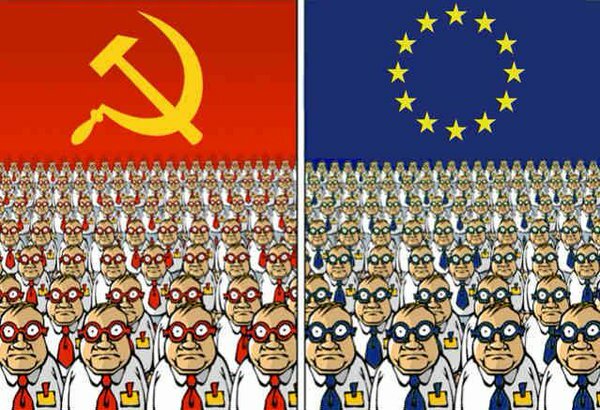 So in the end, the EU is actually reaching into our pockets and taking money from us. As U.S. Treasury Secretary Jack Lew said yesterday, “I have been concerned that [the EU’s decision] reflected an attempt to reach into the U.S. tax base to tax income that ought to be taxed in the United States.” Secretary Lew is being very diplomatic. The more frank way of saying that is the EU is trying to steal from US taxpayers. Here is the truth — the EU sees a successful American company and wants to reach into its bank account. It isn’t a lot different than when a thief spots a businessman in a nice suit and targets him for a mugging. The EU’s avarice knows no bounds and so it will use any pretext — even claiming that Ireland does not understand its own tax law — to impose additional taxes. In the process, the EU in effect robs Americans of $14.5 billion. If this stands, the EU will be reaching into American pocketbooks and wallets every year in greater and greater amounts to pay for their excesses and their failed top-heavy, oppressive regulatory regime model of government. This is precisely why Brexit was a success despite the lies used to defeat it. If Europeans like this system, they can have it. But we must stop them from forcing Americans to fund their choices. American leaders need to stand up and be crystal clear that this will not stand. This is not Apple’s problem. It is our problem. The EU has found a way to make Americans foot the bill for the EU’s extravagant waste. We must put a stop to this now. There can be no compromise. This is an act of bare and raw criminality and theft hidden behind fancy European accents and official EU letterhead. But if it is allowed to stand, soon Americans will be heavily taxed by foreign powers simply because we allowed it to happen. Being taxed by a European power across the Atlantic with whom we have no representation takes us backward to before 1776. Let’s not sit by and let that happen.